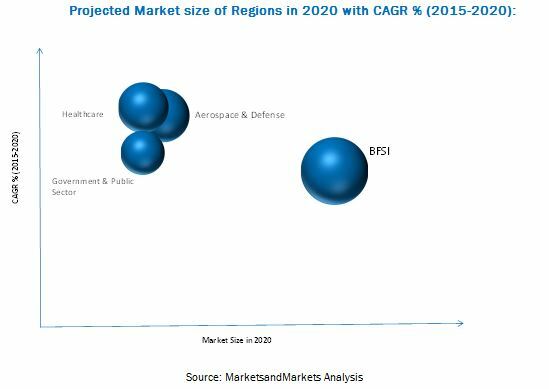 [125 Pages Report] The global Database Encryption Market size was USD 261.8 Million in 2015 and is projected to reach USD 968.3 Million by 2020, growing at a Compound Annual Growth Rate (CAGR) of 29.9% during the forecast period. The database encryption market is witnessing tremendous growth and presents many opportunities, making it a lucrative market. The increasing volume of business and customer data generated among organizations has led to the threats of theft or being hacked, which are driving the adoption of database encryption solutions. The major area of opportunities for database encryption is the increasing demand for cloud-based database and cloud-based database encryption solutions. The need to comply with regulatory mandates by the government and other regulatory authorities and the increasing digitalization among the organizations and the economies are some of the major factors boosting the growth in the market. The growing demand for database encryption solutions owes to the availability of flexible encryption solutions is supporting the growth of this market. The overall market has been segmented by type, deployment type, end user, and industry vertical. This study has been done on a global level, covering five regions broadly, namely, North America, Europe, Asia-Pacific, Middle East and Africa, and Latin America. The research methodology used to estimate and forecast the database encryption market begins with capturing data on key vendor revenues through secondary research. The vendor offerings are also taken into consideration to determine the market segmentation. The bottom-up procedure was employed to arrive at the overall market size of the market from the revenue of the key players in the market. After arriving at the overall market size, the total market was split into several segments and sub-segments which are then verified through primary research by conducting extensive interviews with key people such as CEOs, VPs, Directors, and executives. This data triangulation and market breakdown procedures were employed to complete the overall market engineering process and arrive at the exact statistics for all segments and sub-segments. The database encryption market is expected to grow from USD 261.8 Million in 2015 to USD 968.3 Million by 2020, at a Compound Annual Growth Rate (CAGR) of 29.9%. In 1961, a computer based login and password was developed to allow more users to work on a single machine. This increased the risk of data leakage due to which, in 1979, the Data Encryption Standard was launched. In 1996, another standard was launched called the Advanced Encryption Standard (AES), to reduce the risk of security breach. Moreover, in 2012, personal data lockers were launched so that organizations can secure their financial and personal information. Furthermore, the rising need for organizations to comply with regulatory standards, the growing demand for cloud-based database, and the availability of flexible encryption software are some factors which are driving the growth in the adoption of the database encryption software. Small- and medium-sized businesses are estimated to exhibit the highest adoption rate; the wide adoption of cloud-based database will present the new opportunities and growth prospects to drive the database encryption market in future. Various database encryption types such as transparent/external encryption, column level encryption, file system encryption, application level encryption, and key management features allow users to encrypt the confidential business and private data according to their needs. Some of the major players offering database encryption solutions with these features include IBM, Symantec Corporation, HP, Microsoft Corporation, Sophos, Vormetric, McAfee (Intel Security), and Net App. These database encryption features comply with various standards such as AES, RSA, Blowfish, and others that are prevalent among various industries. Various regulatory mandates such as PCIDSS, HIPPA, GLB, and FIPS have to be adhered to mandatorily by various industries such as BFSI, healthcare, IT & telecom, government & public sector, retail & e-commerce, and aerospace & defense. The BFSI, healthcare, and IT & telecom verticals are expected to have the largest database encryption market share. Database encryption solutions can be deployed both on-premises and cloud. Factors such as high cost of encryption solutions and lack of proper key management are some of the factors restraining the growth of the market. However, the increasing demand for cloud-based encryption solutions is expected to drive the growth of the market in the future. The companies have also adopted various organic and inorganic growth strategies to increase their share in the market. New product/service launch is the major key strategy followed by companies such as IBM, Symantec, McAfee, and Oracle. This strategy accounted for 46% of the total strategic developments in the market. Furthermore, companies such as McAfee and Vormetric have also adopted strategic partnerships and collaborations as an important strategy to enhance their product offerings and distribution networks in the local market. This strategy accounted for 14% of the total strategic developments in the database encryption market. The mergers and acquisitions strategy accounted for 29% of the total strategic developments and is adopted by top database encryption companies such as IBM and Gemalto.